Pacific herring (Clupea pallasii) have a broad distribution in the eastern Pacific, ranging from Alaska to northern Baja, Mexico. Humboldt Bay has one of the largest spawning populations of Pacific herring in California. Other significant Californian spawning populations include San Francisco Bay (the largest), Tomales Bay, and Crescent City. Since the early 1970s these populations have supported a commercial fishery targeting herring for their roe, primarily for the Japanese market. Herring are also targeted by sport anglers, who harvest them for bait; however, smoked herring is becoming increasingly popular. As ‘forage fish’, herring are a critical component of California’s coastal ecosystems and are an important food source for salmon and other recreationally and commercially harvested marine fish. In addition, a variety of ecologically and recreationally important birds, including black brant, green winged teal, scaup, surf scoters, buffleheads, and other ducks, use herring eggs as a valuable source of winter nutrition. 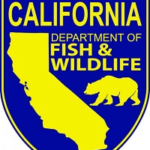 To manage and protect this important resource it is essential for the California Department of Fish and Wildlife (CDFW) to monitor several aspects of the population and their habitat. Because of increased development pressures on the bay and the up-coming statewide fisheries management plan for herring, CDFW re-established spawning habitat mapping and began to update age structure, size structure, and fecundity information in 2014. This work has been conducted in collaboration with Ken Bates of Cloudburst Fishing Company and with support from the Humboldt County Fish and Game Advisory Commission. Spawning in Humboldt Bay typically occurs between mid-December and mid-March. Herring often enter the bay and spawn in several distinct ‘waves’ as different groups of fish ripen. However, in recent years spawning activity has been more truncate and has mostly occurred as a single extended event. In the 2014-15 season, a minor spawn occurred on December 23rd, with the majority of spawning occurring between February 1 –7. During the 2015-16 season spawning occurred between January 19 -27. Herring do not eat during the spawning period, which may be up to several weeks. As such, they are keen to resume feeding in the ocean and most fish leave the bay immediately after spawning. Eelgrass is the most important spawning habitat in Humboldt Bay (Photo 1). 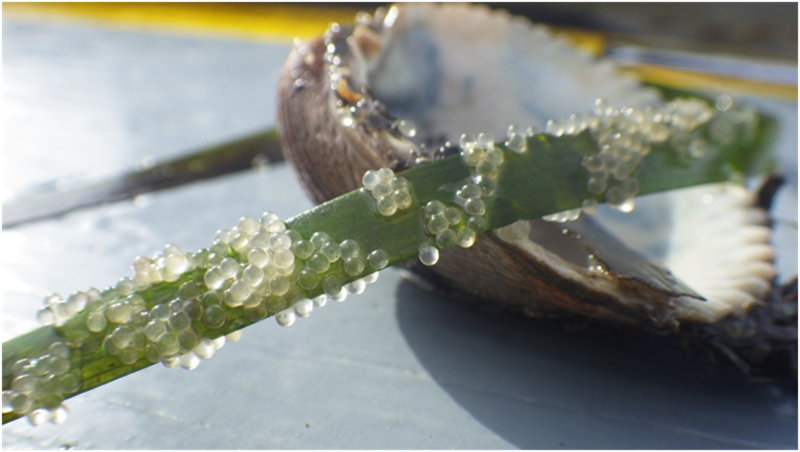 Photo 1: Herring eggs on eelgrass. 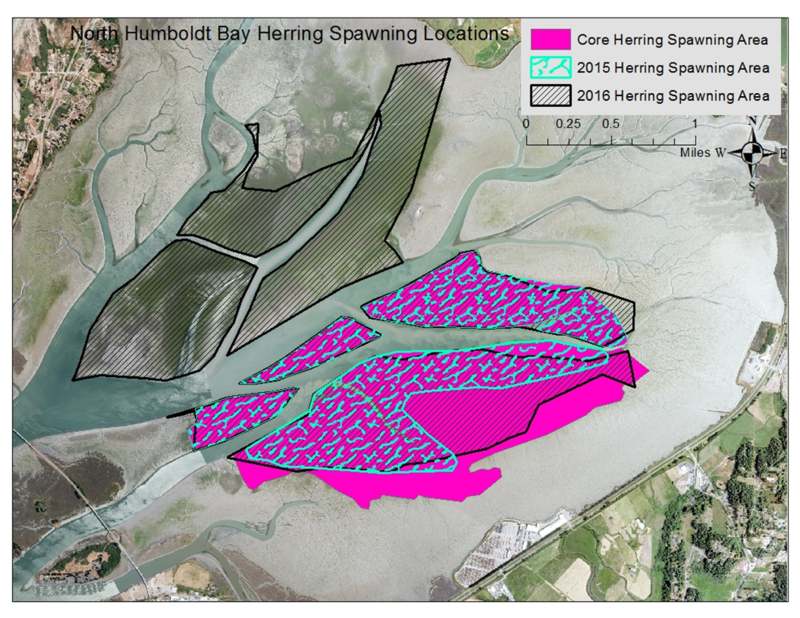 Herring spawn in several locations throughout North Bay, and to a lesser extent in South Bay. However, an area on the eastern side of North Bay, referred to as the ‘core spawning area,’ has been identified to contain the most important spawning beds (shown in pink on map). In the 2014-15 season, herring spawned almost exclusively in the core spawning area (shown as turquoise shading on map). In 2015-16 herring spawned in both the core spawning area and on the west side of the bay (shown as black diagonal lines on map). This pattern of spawning occurs less frequently and may be a function of specific environmental conditions, such as high outflows of fresh water from Freshwater Creek or higher herring abundance causing them to disperse more widely to spawn. Research has shown that site-specific environmental conditions other than just the available habitat (e.g., wave action) can influence herring egg survival rates. Therefore, it is likely that, while herring do select sites based on spawning habitat suitability, they also select sites for other important reasons that may not be apparent to us. As such, spawning sites, like the core spawning area in eastern North Bay, which have a record of long term use, are of significant importance to the population and should be prioritized for protection during development planning processes. To characterize age structure, size structure, and fecundity of the herring population for the 2015-16 spawning season, fish were sampled using a 750 foot lampara net. Samples were taken from throughout the spawning period. The length frequency (numbers of fish in defined length categories) of fish sampled from Humboldt Bay is shown in Figure 1. 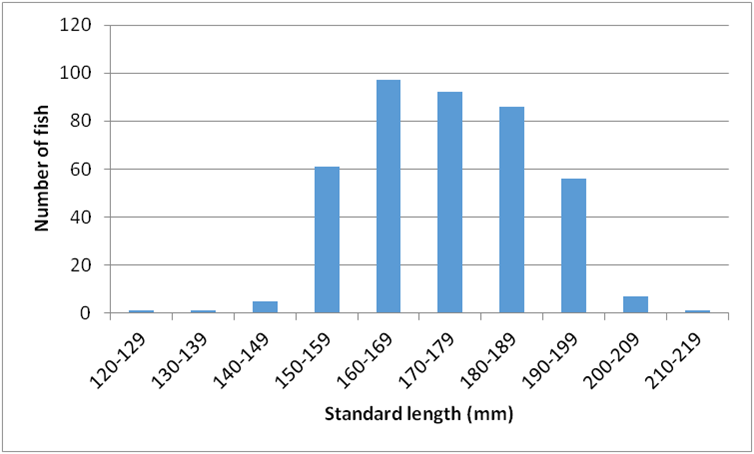 Fish length ranged from 125 to 213mm. The last systematic evaluation of length was during the 1974-75 and 1975-76 seasons by Rabin and Barnhart of Humboldt State University, where length ranged from 157-230mm and 166 to 223mm respectively. This suggests larger fish were present in the population in the 1970’s than now; however, additional samples are needed to confirm this. Rabin and Barnhart showed that fish from both of their sampling seasons ranged from 2 to 11 years old. Otoliths (ear bones) were removed from each fish sampled in 2015-16 and will be analyzed by CDFW for age this summer. However, it is possible, given the smaller size of the fish in the current sample that the oldest age classes of fish, which tend to be the largest, are not present in the population. Figure 1: Length frequency of Humboldt Bay herring 2015-16. The mean fecundity (the number of eggs per gram of female body weight) for the 2015-16 season was estimated to be 240 (+/- 14). This overlaps with the fecundity estimate provided by Rabin and Barnhart in 1975 of 220 (+/-35). Based on this, the total numbers of eggs per female fish ranged from 13,363 to 30,771 in 2015-16, whereas Rabin and Barnhart found the total number of eggs per female fish to range from 9,511 to 50,489 in 1975. Older, larger female fish can produce more eggs than smaller fish. Understanding fecundity is important for accurately estimating the abundance of spawning populations of herring. Pacific herring are a key component of California’s coastal ecosystems providing valuable ecosystem services. The eggs, juveniles, and adult fish provide food for other fish, invertebrates, birds, marine mammals, and humans. Many of the species herring support are commercially or recreationally important for humans, including salmon, ground fish, crab, and waterfowl. CDFW and its partners will continue to collect data to inform the protection and management of this valuable resource.